On the edge of a secluded forest, the Timeless Bed and Breakfast greets its guests with promises of home-cooked meals, warm fires, and great service. Caleb and Ginny put everything they have into their little inn, keeping their own pains hidden from their guests. But when a poor young couple gets stranded at their inn on Christmas Eve in the middle of a blizzard, Ginny knows they can’t turn them away, even though they are completely booked for the holiday. However, letting them stay will push her strength to the limits and churn the deep wells of sadness inside her. This heart-warming but wrenching novelette explores the events of the Nativity story, while simultaneously delving deep into the painful world of infertility. This story is not a light and cheery Christmas rom-com, but rather a heartfelt tale full of realistic emotion mixed with an unfading tinge of hope. The heroine, Ginny, is rather difficult to befriend. We see her in one of her most painful moments, upset with her responses to the situation but ultimately willing to rise to the occasion, especially with the tender support of her husband. I would have loved to see just a bit more of her sweeter side, which makes itself known now and then. Still, her hurts and heartaches stir up empathy, and it's easy to understand her struggles with jealousy and sorrow. The story mostly takes place on a fierce winter night. Quick glimpses of the inn make it seem like a lovely vacation destination, but it's in a tucked-away room in the garage where the external and internal battles—the heart of the story—are fought. The descriptions feel authentic, and the characters have a way of winning over the reader in their flaws, fears, and hope for the future. And Caleb, Ginny's husband, is such a sweetheart! 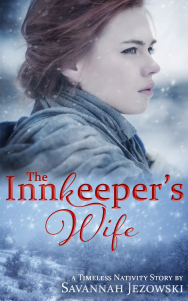 The Innkeeper's Wife is a very focused story about infertility and birth, years of someone's waiting meeting the arrival of new life. It's heavy, but still infused with light. If you're looking for a short read to make you think, encourage your compassion, inspire selfless acts of emotional bravery, and remind you of hope in the hard times, this one has a lot to offer during the holidays and beyond.